Oh hay! 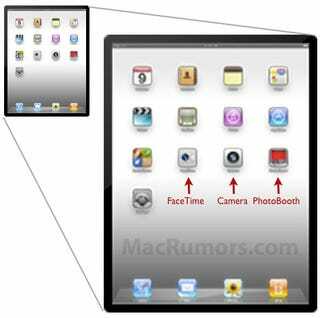 While digging around in the recently-released iOS 4.3 Beta 2, MacRumors found three app icons that seem to confirm the presence of (at least) a forward-facing camera on Apple's next iPad: FaceTime, Camera, and PhotoBooth. None of the icons appear in the current build of iOS 4.2, suggesting that Apple is getting their software ready for a camera-equipped tablet in the near future. Which is not all that surprising at this point! The addition of a camera—or, quite possibly, both front and back cameras—was always one of the most likely updates for the second generation iPad. Recent reports have suggested it'll also have a thinner, lighter design, an SD card slot, and a snappier processor.